Active Folate (Methyltetrahydrofolate)® by Blood Detective™ Nutritionals supplies 1,000 mcg of biologically active folate called (6S) 5-methyltetrahydrofolate (5- MTHF). 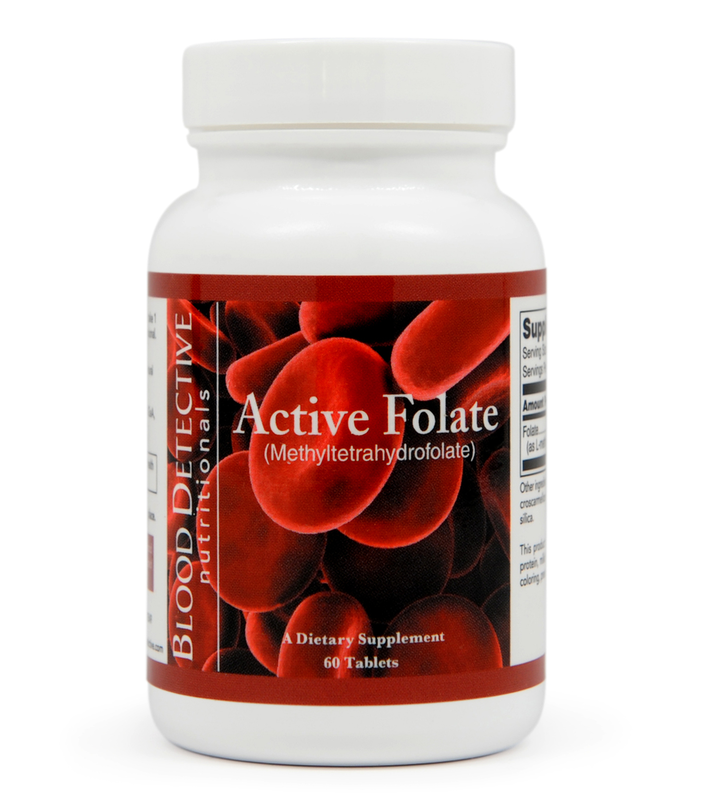 Active Folate (Methyltetrahydrofolate)® by Blood Detective™ Nutritionals supplies 1,000 mcg of biologically active folate called (6S) 5-methyltetrahydrofolate (5-MTHF). Metafolin® folate is a patented, natural form of (6S) 5-methyltetrahydrofolate (5-MTHF). 5-MTHF is the naturally occurring, predominant form of folate commonly found in cells and is essential for overall health, as it participates as a cofactor in a reaction that involves the remethylation of homocysteine to methionine. Unlike synthetic folic acid, 5-MTHF can be used directly by the body, without the need for an additional conversion via the enzyme 5,10-methylenetetrahydrofolate reductase (MTHFR). In certain populations, the body’s ability to convert folic acid to 5-MTHF by use of this enzyme may be compromised due to genetic differences. Metafolin® contains only the S isomer of 5-MTHF and has been shown to be the only form of folate to be able to cross the blood-brain barrier. Metafolin® does not appear to mask the anemia associated with a vitamin B12 defi ciency and presents no risk of an accumulation of un-metabolized folic acid in the body. Active Folate (Methyltetrahydrofolate))® is a useful dietary supplement for those individuals that prefer a high dose active form of folic acid called (6S) 5-MTHF.